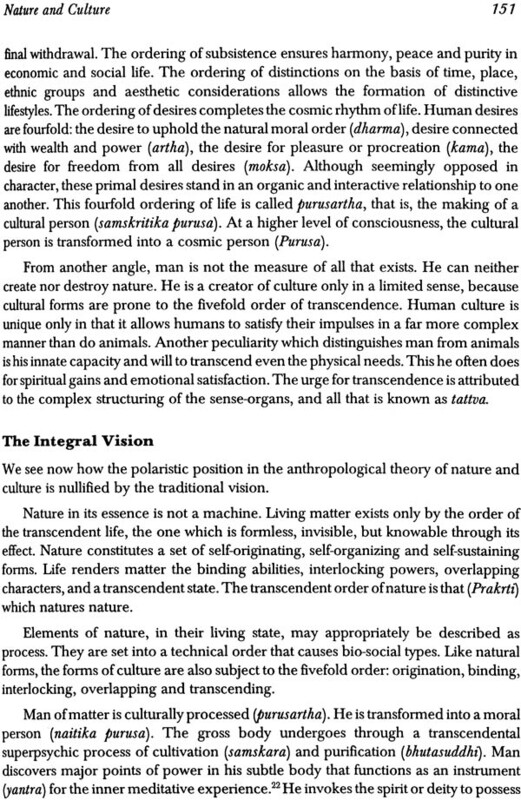 PRAKRTI : The Integral Vision explores the concept of the primal Elements (Sky, Air, Fire, Water, Earth, etc.) which has governed and determined the evolution of civilizations and cultures. This 5-volume collection is the outcome of a series of five successive but inter-locked seminars culminating into cross-cultural, multi- disciplinary understanding. 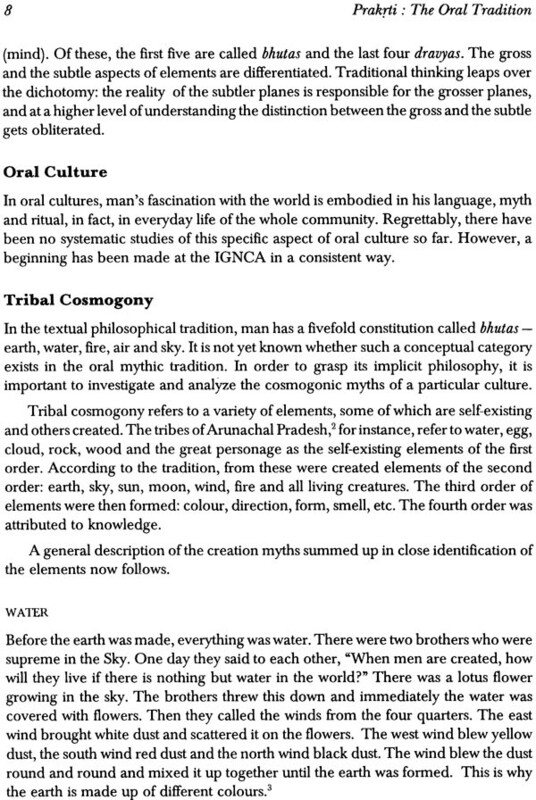 The First Volume, Primal Elements: The Oral Tradition, focuses attention on the articulation of cohesive communities communicating with the Elements in continuous unceasing dialogue. To them the nature is not a matter of intellection; it is a question of life here and now. This is manifested in their primary myths and rituals which sacralize nature so that man can live as an integral part of the Universe. The Second Volume,Vedic, Buddhist and Jain Traditions, centres on the texts, probing deep into the Vedic rituals, Upanisadic philosophies and Jyotisa sastra. There is a prodigious consideration of the concept of maha-bhutas in Buddhism and Jainism. It also brings forth the many covergences and divergences of the view-points between and amongst these different streams of Indian thought. The Third Volume, The Agamic Tradition and the Arts, examines systematically the manifestation of the Elements in the Indian arts and their Agamic background. From the different vantage points of the architect, sculptor, painter, musician and dancer, the field is reopened here to discern the structure of the arts at its primal level. Experiences of the transformation of the gross to the subtle and the theories of aesthetics and cultural ecology emerge from such a captivating view-point. The Fourth Volume, The Nature of Matter offers a much-needed critical appraisal of modern scientific concepts with reference to traditional thoughts. 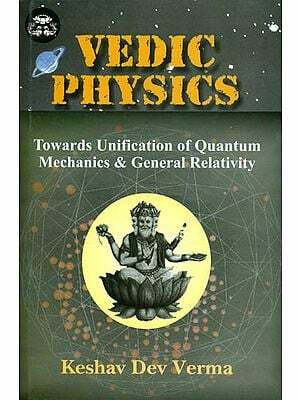 It contains invaluable discussion on quantum theory and elementary particles, evolution of living matter, nature and function of matter, scientific philosophy and Buddhist thought, Sankhya theory of matter, ancient and medieval biology, mysticism and modern science, traditional cosmology, matter and medicine, matter and consciousness, etc. The dialogue created between the method of science and the method of speculation is invigorating. The Fifth Volume, Man in Nature, is a coming together of cultures and disciplines. Enchanting in their own way, the international community of scientists, philosophers, anthropologists, ecologists and artists, share in this volume the myths and cosmology of their respective societies and cultures. There emerges a most meaningful dialogue between those who live with the myths of primordial elements and those who have modified the tools of science to investigate the nature of matter. This 5 -volume set, first of its kind, produced by the most distinguished specialists in the field, should enjoy a wide readership amongst philosophers of many different persuasions, scientists, theorists of art and culture, particularly ecologists and anthropologists seeking new insights into the phenomena of Nature. In 1986 when the first of the Multidisciplinary and Cross-cultural Seminars was held under the aegis of the Indira Gandhi National Centre for the Arts, there was a trepidation. In my Introduction to the Volume on Concepts of Space: Ancient & Modern I have shared with the readers the sense of challenge as also of gratification. Then, it was not easy, nor has it been easy in the subsequent years to bring together people from different parts of the world of diverse disciplines and levels of society to speak through a multiplicity of languages to reflect and converse, and have a meaningful dialogue on the fundamental concerns of humanity in the past or present, in science or religion, philosophy and the arts, in civilizations as far apart as Egyptian, Chinese, Greek and Indian, permeating expressions through the written or the oral word, generating a language of myth and symbol which communicates across cultures. The gathering, the dialogue and the discussion on a single concept of Space (Akasa) made it evident that the more fundamental and universal the concept, the greater the probability and possibility of diverse interpretations at multiple levels. The single concept of Space had taken us through the journey of the concepts of cavity, cave, aperture, fountainhead, body, air, sky, vacuity, cipher, point and much else. The scientist and the technologist explored the concept through their method of empirical investigation, the philosopher and the metaphysician, artists and the sociologist through perennial questioning and speculation. The two approaches and methods we learnt were complementary and not in conflict. The arts, architecture, sculpture, painting, music and dance enclose, embody and evoke space. Poetry creates vast edifices of space as spatial situations, and evoke the experience of outer and inner space. The concern with Space (Akasa) could not be dissociated from the concern - the concept of Time (Kala). Two years later, a similar gathering with many familiar faces (who communicated with one another with greater ease) gathered to deliberate upon the many dimensions of Time (Kala). Once again, the discussions at that Seminar revolved round the micro and the macro levels of the single concept, from molecular time to the cosmic time, from the time of biologists to the time of astronomer, from the time of the seer and meditator to the time of the architect, sculptor, musician, dancer and the poet. Besides the familiar faces, there were others who had joined the family of the IGNCA. The enlarged family gave this Seminar a depth and richness, unique and unparalleled. The experiences His Holiness The Dalai Lama articulated in words lucid and resonant, were juxtaposed with the precision and meditation of a scientist - the late Professor D.S. Kothari. The depth of the experience of Time in religious traditions, Islamic, Christian, Hindu, Buddhist, jain and Hebrew, and the embodiment of inner and outer Time in poetic language was shared through rapt silence through the voice of the Poet Kathleen Raine. 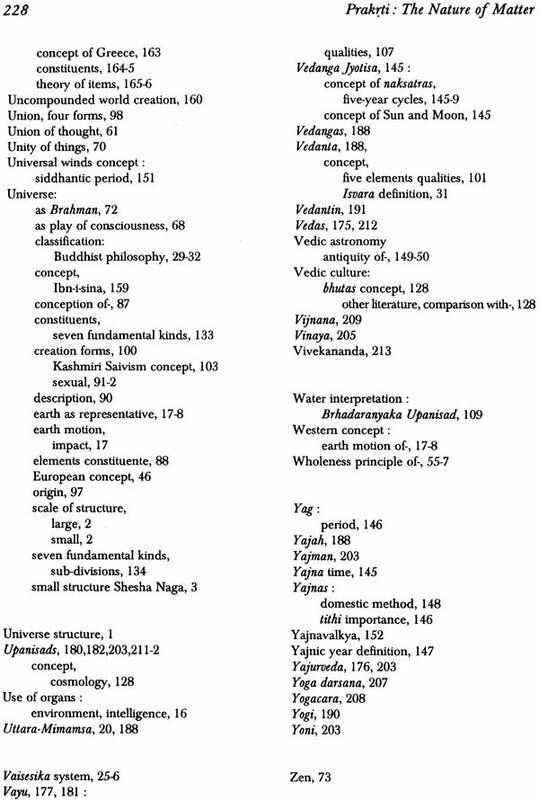 Logically and naturally, from these two fundamental and universal concepts the next step in our quest for exploration of a single universal theme through diverse paths recalling the Rgvedic Verse, Truth is one; man knows it by different names, was to explore the concept of the primal elements (five or four) in different civilizations which have governed and determined the evolution of civilization and culture. Perhaps, the first conscious awareness of Man was the fact that his life depended on water, Earth, air, fire and, above all, space. Understandably, in all civilizations, at the most sophisticated level as also at the simplest level, the recognition that the primal elements were primary and indispensable for Man, is universal. Myths of the origin of the universe, creation, cosmology and cosmogony, have been developed on the concept of the elements which are four or five. There is a vast body of primary sources and equally extensive and complex a history of critical discourse on the nature of primal elements and their indispensability, not only for Man but for all life on Earth. The subject was too vast and too monumental to be taken up in a single Seminar. Organizationally, therefore, this time it was decided to hold five successive but interlocked Seminars, one leading to the others, so that they could all culminate in a final international cross-cultural multidisciplinary Seminar. Since cultures, disciplines, and levels of society are not completely autonomous and insulated, there was a planned and understandable overlapping between one Seminar or Workshop and another. The five Seminars were divided more for facility than the autonomous nature of each area or field. The discussions, therefore, at one Seminar were taken up and did interpenetrate into the next. Logically, the first of these Seminars focused attention on the articulations of cohesive communities in the world who have lived in harmony with nature and who have communicated with the five elements in a continuous unceasing dialogue. To them the nature of the five elements - water, earth, air, fire and space - is not a matter of intellection or breaking down into separation and divisions of totality or a whole; instead, it is a question of life here and now. This is manifested in ritual practices which sacrilize nature so that man can live as an integral part of the universe, the rhythmic movement of the changing seasons, and the symmetrical punctuation and cycle of seed sprouting, growing, flowering, fruiting, decaying and renewing. In modern discourse this is understood as the need for man to live in harmony with the environment for an evolution of socio-cultural systems and methodologies for ensuring the maintenance of ecological balances. The lives and lifestyles of these cohesive groups have begun to acquire renewed validity on account of what man has done to pollute, contaminate, desacrilize and desecrate the very fundamentals that sustain him and make it possible for him to live on earth. The first Volume is based on the papers submitted at this Seminar. The second Seminar moved the emphasis to the textual traditions. There is a vast body of literature in Greek, Chinese and Indian sources where philosophic discourses have been held on the nature of the universe, the nature of matter, the elements and the possibility of transmutation of the gross to the subtle. In India all branches of the philosophic streams have discussed the nature of the Bhutas and the Mahabhutas. 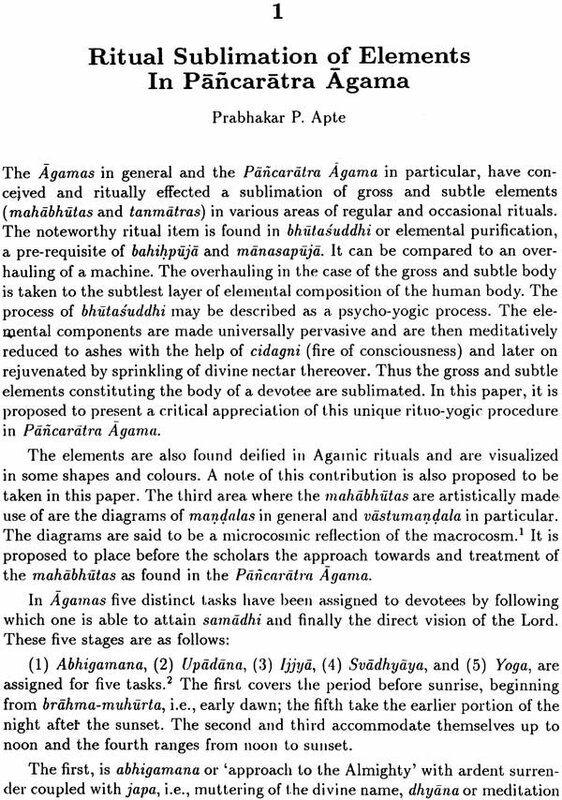 The discussion ranges from the earliest articulation on the subject in the Rgveda to the philosophic schools of Vaisesikas, Vedantins, Saiva and the Agamas. The old system of Ayurveda in India, as much of medicine in Greece in a very different way, is based on the concept of the Mahabhutas in the constitution of the body itself. The very conception of the five elements constitutes the body. Texts for Indian astronomy, chemistry, metallurgy are replete with discussions on the elements. This discussion cannot be dissociated from a speculation, and discourse of, the nature of the universe, cosmology, cosmogony. The second Seminar delved deep into each of these aspects specially in the Indian tradition - Vedic, Brahmanical, Upanisadic and Tantric. In addition, there was a consideration of the concept of the Mahabhutas in Buddhism and Jainism. This Seminar unfolded the very complex and subtle aspects of the discourse on the nature of the matter, the fivefold organic matter and the five external objects. It also brought forth the many convergences as also divergences of viewpoint between and amongst these different streams of Indian thought as exemplified in the textual tradition. The Seminar was hosted by the Department of Sanskrit, University of Poona, Pune. The second Volume of this series is based on the papers and the discussions held at this Seminar. Logically, the third Seminar had to and did explore the discussions as also the manifestations of the five elements in the Indian arts, along with their Agamic background. 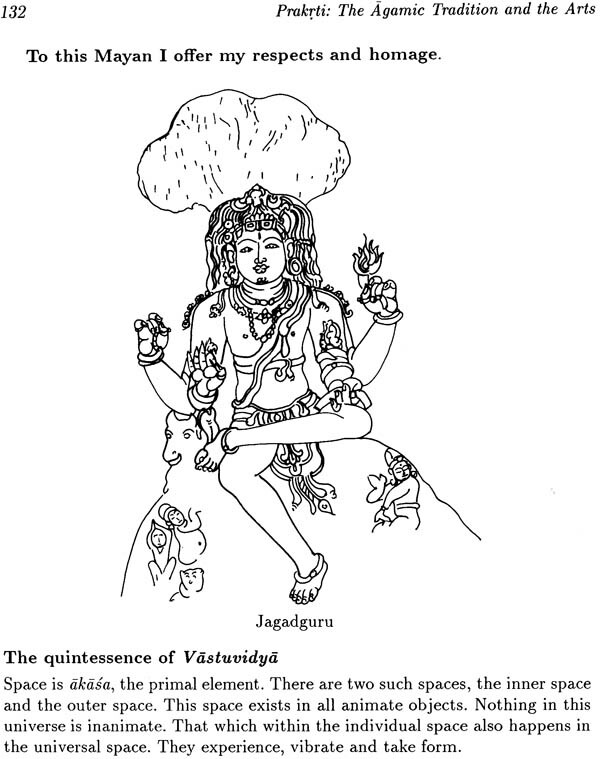 As is well recognized, while the Upanisads provide the basis for speculative thinking, the Brahmanas give the methodology of ritual practice (Yajna and Prayoga). 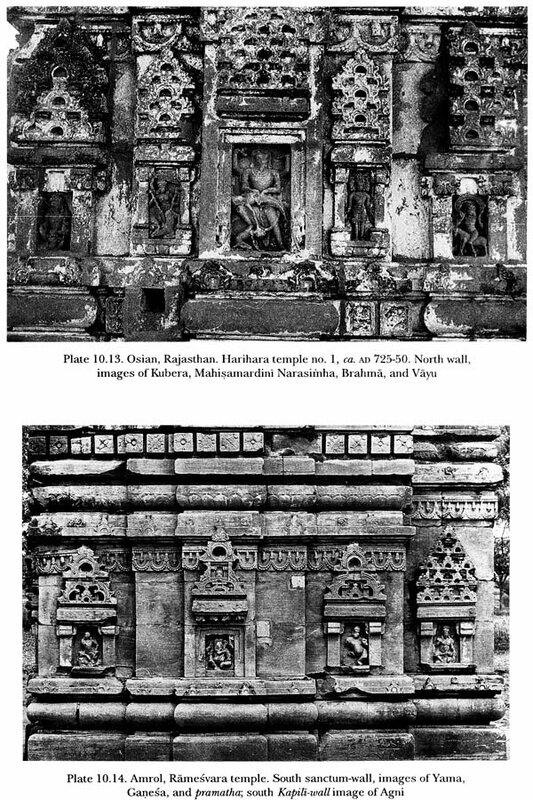 Parallel is the development in early and later medieval India where the texts on Vastu and Silpa provide the frame-work of the abstract principles of creating concrete structures through different media and in different forms. The Agama is the twin which provide the methodology of enlivening, giving life and breath to the concrete structures and forms of art. If monumental architecture, sculpture, painting, music or dance, poetry or theatre, is created on the comprehension of space and time, they are even more built on the system of correspondences first for embodying and then evoking the five elements. 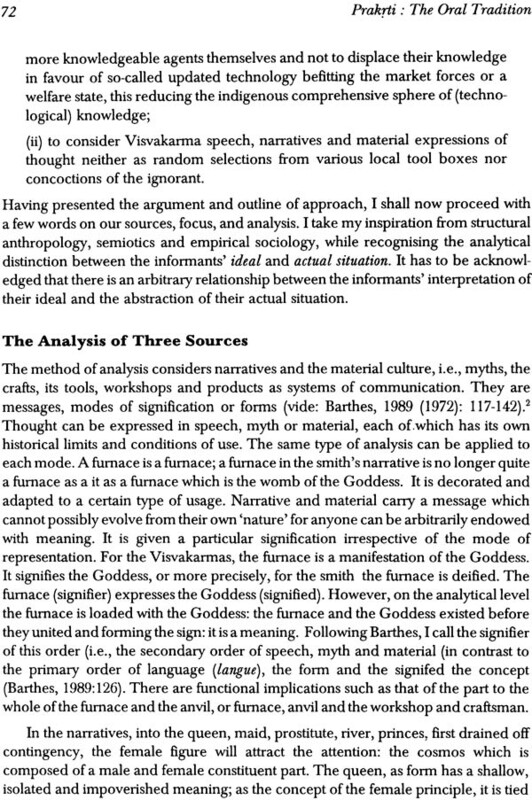 The fascinating and unceasing cycle of the movement from the inner experience to the creation of form, which would incorporate the five elements and the employment of a methodology of ritual, is outlined in the Agamic texts only to achieve the end experience of the transformation of the gross to the subtle. This was the subject of this Seminar. From different vantage points of the architect, sculptor, painter, musician and dancer, the field was re-opened to examine the structure of the Indian arts at its primal level. Naturally, theories of aesthetics which have emerged from such a viewpoint had to be discussed and many questions asked. The third Volume incorporates the span of the papers presented and the discussions held at this Seminar. If the arts deal with the process of transmutation and mutation of the subtle to the gross, and the evocation of the subtle from the gross, in other words, the process of the abstract and the concrete suggesting, stimulating and evoking the abstract, then the astrophysicist deals with the nature of primal matter itself. No discourse on the elements could have been completed by excluding the discussion on modern physics of elementary particles and the most recent developments in microbiology. The fourth Seminar took up the question of the nature and function of matter itself and discussed the theories of the creation of the universe and emergent cosmologies in the modern physics. This was juxtaposed with the consideration on the nature of matter and consciousness. It was obvious that the new developments in science were, perhaps, not all that far remote from the earlier insights in the context of consciousness. The debate between the nineteenth Century mechanistic science and the modern physics was re-opened. This was juxtaposed with speculations and the philosophic discourses in the Indian philosophic schools. If the second Seminar dealt with the textual traditions and the philosophic schools of Samkhya, Mimamsa and the Vaisesikas, this Seminar looked at these traditions as structuralistic traditions from a scientific point of view. The dialogue created between the method of science and the method of speculation was invigorating. The fourth Volume comprises papers and discussions at this Seminar. The fifth and the last Seminar was a coming together of cultures as also disciplines. Coordinators of the earlier Seminars presented brief Reports on each of the Seminars which provided the background and the landscape. The international community, comprising scientists, biologists, philosophers, anthropologists, ecologists and artists shared not only the myth and cosmology of their particular societies but also there was a most meaningful dialogue between those who lived in the awareness of the primordial myths of the elements and those who had employed the tools of science to explore the nature of the phenomenon of matter. The putting together of the deliberations of the five major Seminars, as a single or a multiple-volume, is a daunting task. Through the combined efforts of the Coordinators of each of these Seminars and, particularly, the Chief Coordinator - Professor B.N. Saraswati and his associates - it has been possible to prepare the five Volumes based on the deliberations of these Seminars as also a companion exhibition which was called Prakrti The Integral Vision". It is my hope that these Volumes will provide material for further discussion and dialogue. The perennial nature of the theme and its urgent and contemporary validity will, I hope, make these Volumes Significant. As I have said earlier in my Introduction, Man stands today at a moment where he is threatened by the pollution, inner and outer, of his own making. The primal elements and the urgent need for purification through austerity and discipline are not the matters of intellectual discourse alone. Their maintenance and sustenance, and the purity of these that are primary and primal, are the objectives of our life, lest death overtakes us. It is my pleasure to introduce the first of the five Volumes, entitled Prakrti : The Integral Vision. This Volume focuses attention on the cosmogonical myths prevalent in cohesive societies which are articulated not as theory but are manifested in lifestyle, ritual practice, medical systems, art forms, music, dance and in the craft tradition. The Seminar brought together a number of scholars who had been working at the field level for the programmes of the Indira Gandhi National Centre for the Arts. Besides, there were others, who have, for years, been pursuing the role of understanding of the five elements in body systems - medicine - preventive and curative medicine and in healing. This was a rich fair. The Volume comprises the Papers and gives an inkling or insight into some of the discussions held at the Seminar. Professor B.N. Saraswati's introduction presents the essence as also the dynamics of the discussions which took place at this Seminar. However, no record of this Seminar would be complete without sharing with the readers, the wisdom, the insight, the scientific as also the meditative, outer and inner, vision of a scientist, thinker and philosopher, a modern rishi - who is no more amongst us - Professor D.S. Kothari - who inaugurated the Seminar, or, one should really say, the series of Seminars. He began with the simplicity of a child's question - a simplicity which can only be given to one who had gone beyond the narrow boundaries of mere intellectual argumentation. "Why do we feel warm in the sunlight?" "Why does the sun feel warm? ", he asked. This is the first and the last question. An attempt to give an answer to this question has been the history of civilizations, he said. Is it a physical phenomenon? Is it the body that feels warm? Is it nature that provides the warmth? Is it only the sun that provides the warmth? Or are there other elements in interaction with the body which produce the warmth? If it is the body that feels warm then what is body? Is it matter? Is it an aggregation of the five elements? 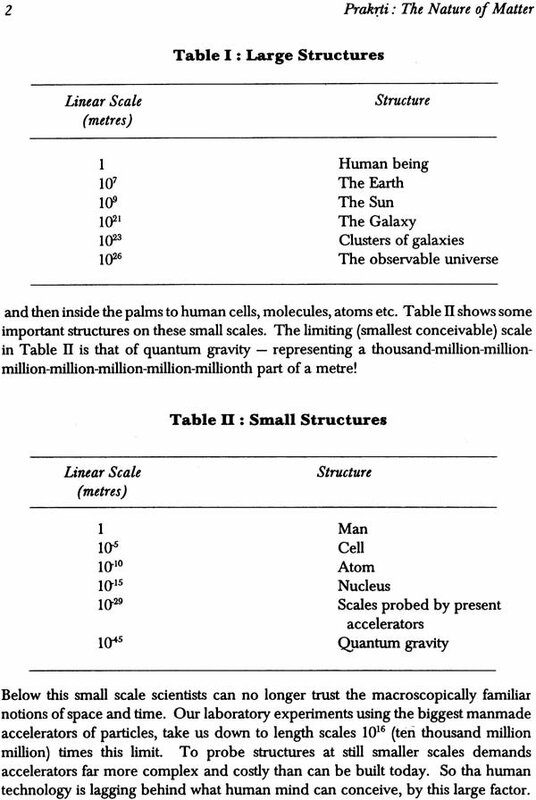 These are simple, child-like questions and within them is embodied the history of philosophy, science and the arts. 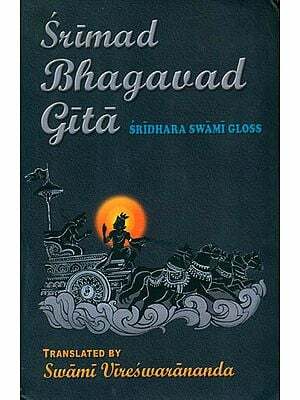 Turning his attention from this, a very simple question, he elaborated lucidly on the eighth, thirteenth and the eighteenth chapters of the Bhagavad Gita, especially on sarira (body) as defined by the Gita. The question asked was: what is sarira? What are the epithets chosen even in seeking an answer to this fundamental question? Krishna calls Arjuna 'Kaunteya', i.e., the son of Kunti - that is the biological link. But is sarira only a physical organism? Sarira is the ksetra (field). Krishna enjoins upon Arjuna to be the 'knower of the field'. He who has the capacity of 'knowing' (comprehending) the field is the ksetrajna. Body, therefore, is equal to the ksetra. And what is this field? The field is the fivefold body - the sheath of nature, comprising the five elements. Almost as a scientific equation, Professor Kothari extracted the essence of the Gita by stating, body = ksetra, ksetra = five elements. And where from do these five elements come? They come from nature, nature here understood by its Sanskrit name prakrti. Is nature dead without attributes? No, there is no absolute dead matter, because nature itself is psycho-physical, psycho-somatic because it is gunatmaka (Le., with attributes and qualities). Thus the system by which man comprehends nature and its elements is not just physical or material, it is a psycho-physical system. It begins with the wholeness. Professor Kothari continued to remind us that the material component of the universe is always changing from moment to moment, body to body, the macrocosm to the microcosm, and yet there is something which remains constant. What is that something? He continued, is it not logical that "I am more than the assembly of the parts and the moment I am more than the assembly of the parts, the implications are clear?" I am part of ananta and infinity, and infinity and a continuity despite every moment of flux and change. Consciousness is the eternity and the immutable, he said. From an enumeration of the thirteenth chapter of the Gita he took us to the eighteenth, where nature of the consciousness of total surrender and of meditation and reflection is articulated. It is thus consciousness and not dead matter, but the combination of consciousness and matter which makes us feel warm in the Sun. Modern science, he reminded us, has realized for the first time that the atom has a wholeness of its own. It is also ananta, its growth is a dynamic process and it is not merely an aggregation of electrons and protons. Time has now come, said he, when science has to be spiritualized, just as the ritual of the indigenous people had been spiritualized so as to sacralize nature. Science and the perceptions at the level of textual traditions, the metaphysics and the arts and those lived by cohesive communities must converge. Science, he said, has arrived at the dictum that the velocity of light is absolute. It is only modern science which is linking physical matter with consciousness, and if the IGNCA has begun this exploration then it must be complimented and congratulated for its courage. Such questions can only be asked in a spirit of humility, modesty and with an openness of mind where the barriers of disciplines and cultures, ideologies and positions are transcended. The symbiosis of knowledge, vision and values alone can bring about a consciousness of the wholeness. How can this happen? It can happen with a sense of feeling, bhavana, of reflection and of meditation. All this is possible only if man lives by the perennial consciousness that he is one amongst all particles of nature, and is also conscious of the probability and possibility that he can be Brahman. The audience was blessed and stood in silence and in grace because a scientist and mystic had spoken. The journey of the Seminar had begun. Ancient vision of the cosmic order has certain fundamental features that separate it from the modern science perspective. The exchange of views between the two systems of knowledge seems to be problematic. Yet, as humans, we cannot dispense with searching for our foundations. Human science presents a picture of the cosmos as seen by man, the master of the universe. It describes the role evolution plays within the biological and cultural spheres; constructs a theory of culture as the tribal microcosm conditioned by human instincts; and creates a super-ideology of power that places man at the centre of the universe. The result of this anthropocentric attitude is that the cosmos sharing the human adventure is overwhelmed by the tension between nature and culture. The traditional vision of man, on the contrary, is cosmocentric. Man is made up of four or five cosmic elements. The cosmic order that governs the dynamism of all reality, envelops human life, creates awareness, and signifies patterns of culture. As a result, the cosmic equilibrium is maintained both in nature and in culture. This primal vision is incontestable and fully integrated in two different but related traditions - the textual and the oral. 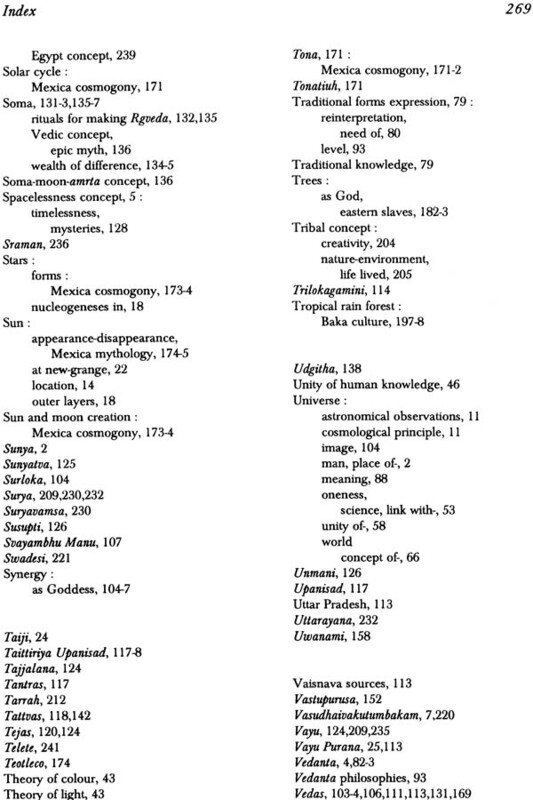 The textual tradition offers a complete and systematic analysis of the universe. Reflections of the oral tradition are more concentrated in practice than systematic in analysis. The essays compiled here are based on papers presented in the seminar on 'Perceptions of Bhutas (Elements) in the Oral Tradition' held at the Indira Gandhi National Centre for the Arts (IGNCA) in February 1992. They trace the areas where reflections on man and the universe emerge. Of these presentations, eleven are the fruits of the IGNCA pilot projects on cross-cultural lifestyle studies. Tribal cosmogony refers to a variety of elements, some of which are self-existing and others created. For instance, the tribes of Arunachal Pradesh speak of water, cloud, mist, egg and wood as the basic elements from which all other elements are known to have originated (Saraswati). For them, as also for other archaic groups, creation is a male-female principle, allegorically termed 'marriage' or 'sexual union' (Adhikary, Prasad, Purohit, Saraswati). It has also been held that the world was created in phases by a number of heavenly bodies and not by one Creator-God, a single supreme being (Saraswati). The hunter-gatherer Birhors divide the world into two halves: the sky and the earth. There is a world beyond the sky and another below the earth. The earth is a round-shaped flat surface; the sky a hollow concave over-arching the earth. The structure of the universe is thus somewhat like a cone, similar to the structure of the Birhor leaf-hut (Adhikary). It is curious that many of the tribes who have never seen the sea, or even large sheets of water, should visualize a primeval ocean from which the universe is said to have emerged. Another remarkable feature of the tribal vision is the notion of the pluriverse. There is, however, no clear distinction between this world and the other worlds. The idea that the world was created in phases made the elements structured in a sequence. In the beginning was a state of nothingness. But this nothingness is described not as an absolute void. Before the earth was created, everything was water, or cloud, or nothing, nothing at all but two eggs which shone like gold. From that state of nothingness came the earth and the sky; and when the sky made love to the earth, every kind of tree and grass and all living creatures came into being (Saraswati). 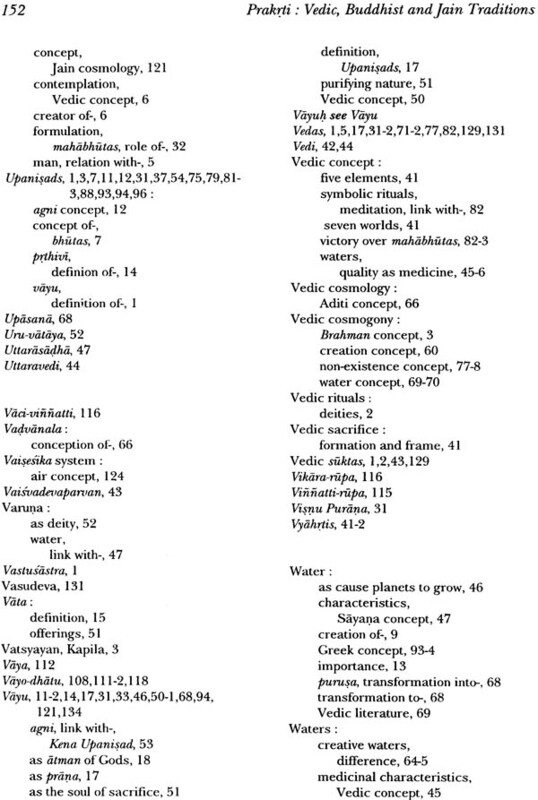 The Santhals claim that water and earth came first, air fourth, man fifth and fire was sixth and the last (Prasad). In the Garhwal Himalayas, the sequence is visualized as follows: from the mysterious syllable onkar to the primeval whizzing; from whizzing air; from air clouds; from clouds water; from water to lotus; and from lotus the creator Brahma was born. In yet another sequence of creation, the earth was first and afterwards the sky; first female then male; first night then day; first guru then disciple; first daughter then son (Dhasmana). The archaic cultures developed their own jargon, just as the modern specialists have complex theories. The tribal notion of the beginning of the universe as 'not absolutely void' seems to be in line with the scientific cosmology. The archaic realization of the origin of the universe from a primeval sound is another interesting resemblance with the theories in modern physics. The primal elements are said to have personal (material) as well as spiritual attributes. The Angami Nagas assign positive quality to water, and both positive and negative qualities to fire. Water is perceived to have cleansing properties; fire, though not capable of cleansing, is regarded as an agent of good and bad fortunes (Joshi). The Bhuiyans ascribe sacredness to all five elements. The earth is associated with their entire lifestyle, rituals and festivals. Fire is an object of worship; it is kindled in a special manner. It epitomizes the fundamental principle of the cosmic order. The power of water is utilized against evil. It is also a medium for transferring sin or impurity to the enemies. For the Bhuiyans the sky and the sun are synonymous. The sun and the earth are always viewed as benevolent deities. The ritual act of blowing (air) heals the sick (Mohanty). The Birhor hunters believe that fire also has life and death; the sun is the supreme creator of all things on earth; a female presides over the earth; and there are deities of rain and storm, thunder and meteor, wind and so on (Adhikary). The marine fishers of Kerala think that every element has a spirit or demon (Mathur). The farmers of Karnataka worship the earth, consider water divine and fire auspicious, associate air or wind with life, and regard the sky as a home for the countless celestial bodies (Chandran). (iii) at a higher abstraction, the reality of the subtler plane is responsible for the reality of the grosser plane. The Arunachal tribes consider man as an integral part of nature. In their perception man is not unique insofar as his origin is concerned. There is no ontological difference between man and non-man. Every element has a form, a location, a function and a dependent relation with other elements. Man is not unique even in the possession of knowledge; for primordial knowledge came to him from birds and animals (Saraswati). The Santhals also think of man and nature as an inseparable whole. According to them the human body is made up of three elements - air, earth and water (Prasad). Different parts of the body are associated with different elements - head and ears with sky, neck and chest with air, stomach with fire, and body with earth (Mital). Thus man as a microcosm fits harmoniously with the macrocosm, both being subject to the rule of the sphere (Patnaik). There are examples of human groups claiming their origin from one specific element. The Bhuiyans (derived from bhumi, land) associate themselves with earth (Mohanty), and the Birhors (bir = forest, hor = man) with forest (Adhikary). 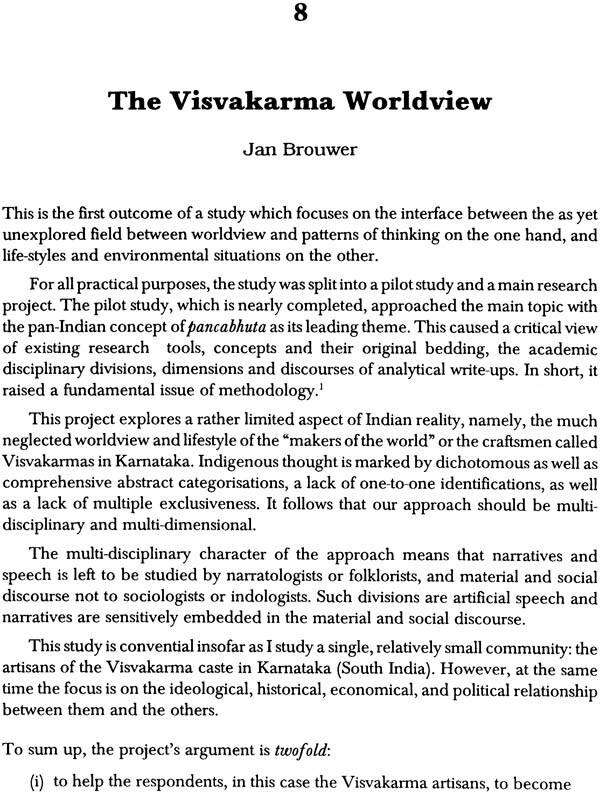 In Karnataka each caste of craftsmen is associated with one of the five elements (Brouwer). 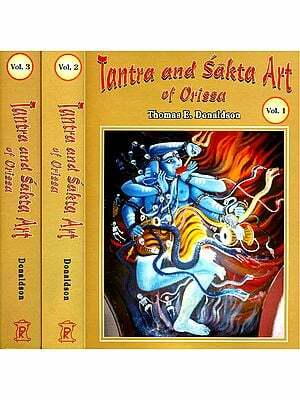 The fact of an intrinsic relationship between the human body and elements of nature is ritually demonstrated by the Paiks of Orissa. Their danda ritual involves group pantomimes on the ground (rolling in dust), acrobating in water, walking on burning coal, and swinging upside down on burning ashes (Citaristi). In traditional lifestyles nature is an arena for the play of man. Man's understanding of the natural phenomena depends on his attitude towards nature, and the kind of relationship he establishes with the natural environment. The analysis of the myths of Arunachal tribes shows that in the tribal perception the forces of nature are set into a creative harmony to the extent that there is no intrinsic disorder in nature (Saraswati). In the Santhal worldview all opposites are united by the male-female principle: air-water, seed-earth, earth-sky, dry-wet, and so on. Fire symbolizes destruction and water restores the world order (Prasad). This ancient vision of spiritualized nature has been destroyed by the modern 'technocentric' civilization. Reporting on the pastoral transhumants in the Garhwal Himalayas, Negi observes that although man and animal are still symbiotically related, man's relationship with nature (ecology) has turned parasitic. Miri's analysis of the Lingami Naga stories shows how man-animal-nature continuum has been disrupted in today's tribal consciousness. The discussion on the five-element theory in oral tradition has shown that different categories of people - the hunter-gatherer, the fisher, the farmer, and the pastoral transhumant - visualize, more or less, the same basic pattern of the universe. Minor variations occur only in the specificity of the ecological conditions and social systems. Since the basic elements of nature are the same everywhere, one can understand perceptual similarity among many of the preliterate groups. The oral mode presents an experiential view of the environment that co-ordinates human life in concrete terms with things and beings around. The textual mode, on the contrary, provides instruments for logical analysis that takes one to a higher level of abstraction. The question, then, is: does the difference in the mode of perception constrain the projection of reality? 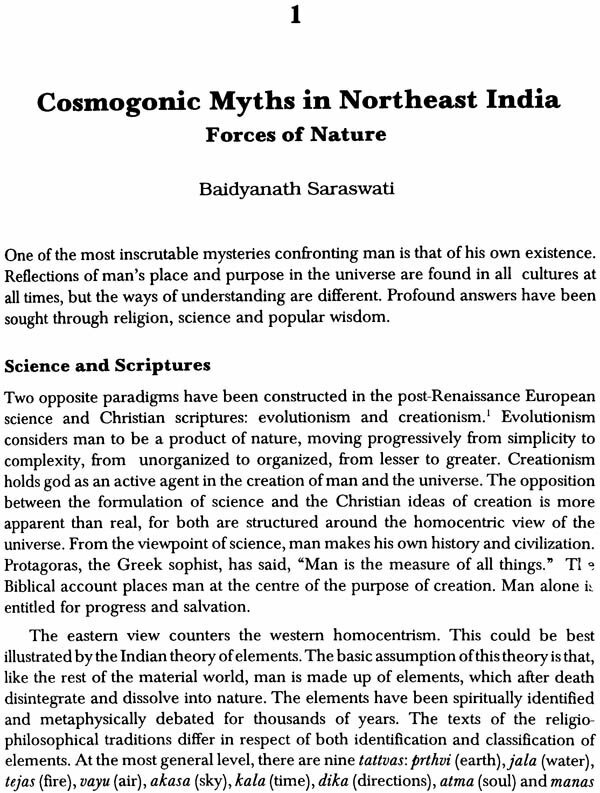 Several contributors to this volume (Brouwer, Dhasmana, Mathur, Patnaik, Verma) have demonstrated that as far as India's traditional cosmology is concerned, there is little difference between the oral and the textual views. This again stands to reason, because India's wider system of beliefs and practices has been operating through crossed-link populations from time immemorial. How does traditional cosmology work across civilizations? As appears from Tan Chung's investigation of the ancient Chinese cosmology, the belief that the world is made up of material elements is deeply rooted in human thinking. Of the five elements of the Chinese tradition - water, fire, wood, metal and earth - only metal does not figure in the Indian system of basic elements. There are areas of conspicuous similarities in the two traditions. 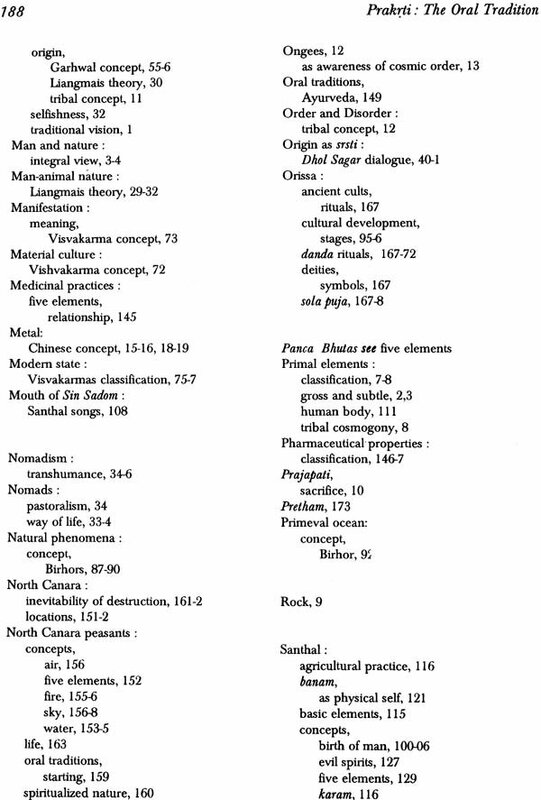 Both the civilizations share in common views on the gross and the subtle aspects of elements, on the fivefold constitution of man and the universe, on the association of elements with colour, sensory organs, emotions, etc., inter-relatedness of the five elements through a chain of reactions, understanding the world in terms of the male-female principle, and the idea that opposites form a harmonious whole. The IGNCA has planned a number of conferences devoted to the study of the basic elements in the ancient philosophies and modem sciences. This venture, being the first in the series, may seem to be largely descriptive; but, whatever the form, it does show that the search for the human foundation has been a common concern of both spiritual and scientific enquiries. India's textual tradition consists of the Vedic musings, Upanisadic thoughts, rituals, Darsana of various orders, Jyotisa, Ayurveda, Vastusastra and so on. Each of these texts deals with concepts concerning man and the Universe. The essays compiled in this Volume are based on the IGNCA series of seminars on five fundamental elements. 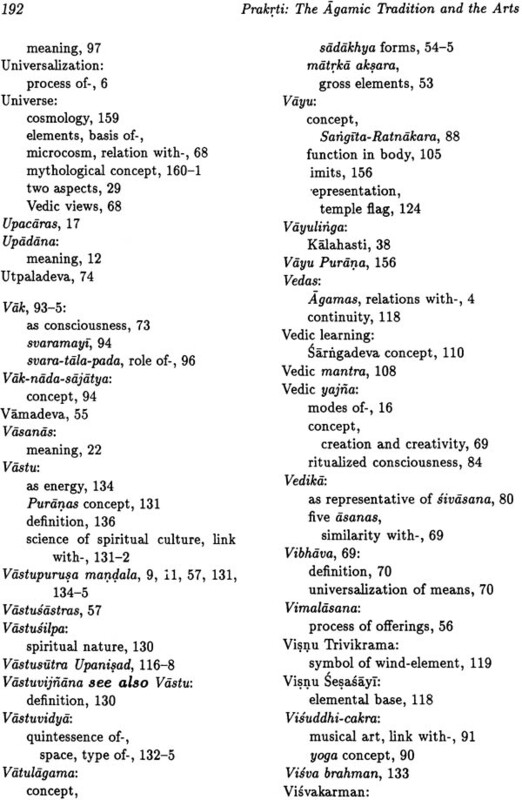 Here the development of the concept of elements is traced through the Vedas, the Upanisads, rituals and other Sastras. The Vedic section is dealt with by S.K. Lal, Srinivas Madabhushi and Usha Bhise . 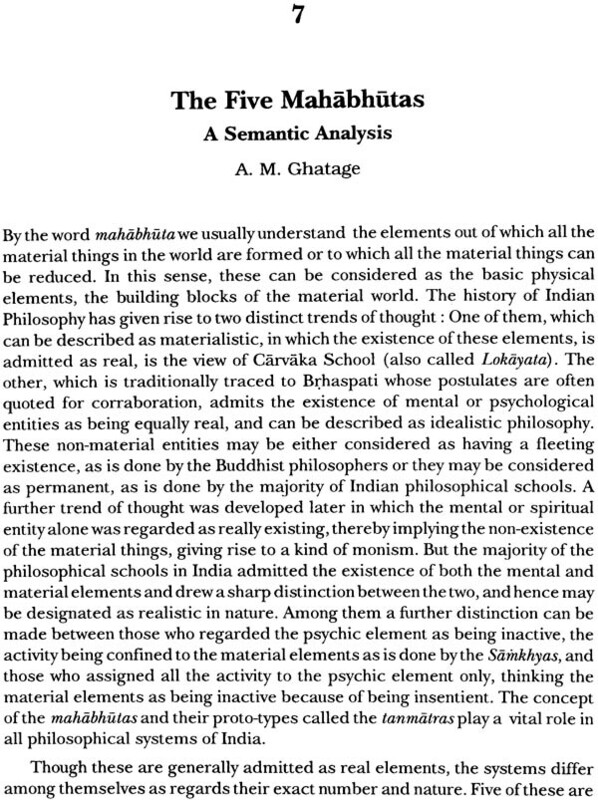 The earliest musings of the Rsis did not specify the five Mahabhutas but have described the creation from tamas, from Primordial waters, from Agni, from Prajapati, Brahman, Atman, Akasa etc. These elements have been deified in the Vedic Suktas, but the later Upanisadic conclusions give a definite shape to these concepts. S.K. 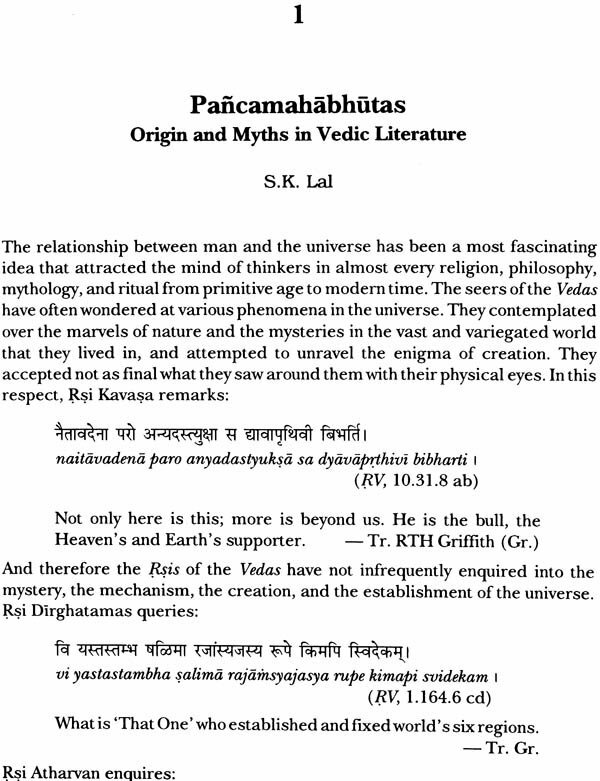 Lal traces from the earliest Vedic period the development of the concept of Pancabhutas. In the beginning water, fire, air, sun and earth were considered not merely as physical elements, but as a combination of both sentient and non-sentient aspects, which led them to treat these elements as deities, to be propitiated for getting their benevolent gifts and escaping from their ire. This was the result of observation of their pervasive nature in all things, and their creative power. 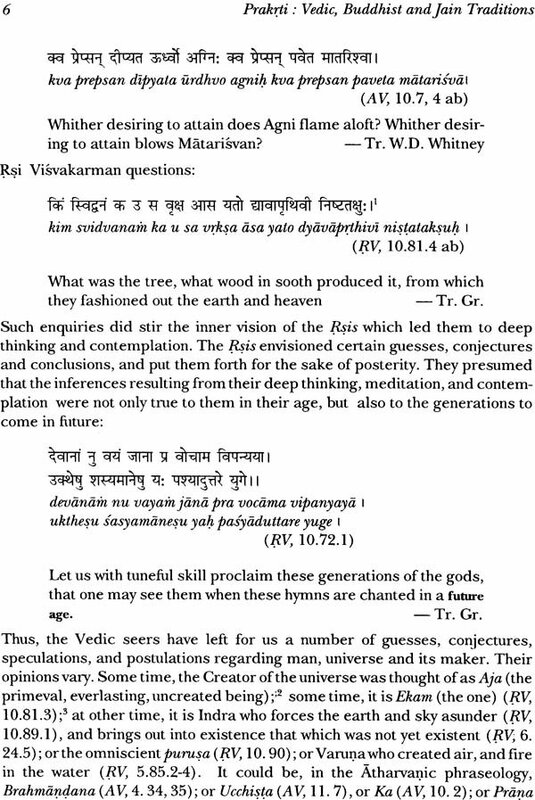 The Hymns of creation of the Rg Veda were reflected in the Suktas of Yajur as well as Atharva Vedas. Srinivas Madabhushi discusses as to how, the Tamas, Ambhas and the fire were considered as the Primeval causes of creation and the development of a conscious principle's will - which is called Brahman - as the universal cause, comparing them with modern scientific theories. Usha Bhise underscores the dominant principle of primeval waters which were considered the cause of the universe and they were treated as sentient beings, having a will and how the earth etc., emerged out of those waters. In this description, she points out the role played by the floods in the Indus Valley of those times. R.K. Mande discusses the Brahman concept, the Trivrtkarana of Chandogya, the Pancikarana based on Taittiriya, the spider example of Mundaka etc. She further elucidates the concept that the essence pervading all things is same and the ultimate aim of man considered there being the conquering of elements. T.N. Dharmadhikari traces in the various Vedic rituals, how the deities waters, fire, air and others were worshipped and offerings were given. This again confirms the conviction of Vedic seers that the bhutas were not merely insentient elements but were a combination of both conscious and non-conscious principles. Pt. N.S. 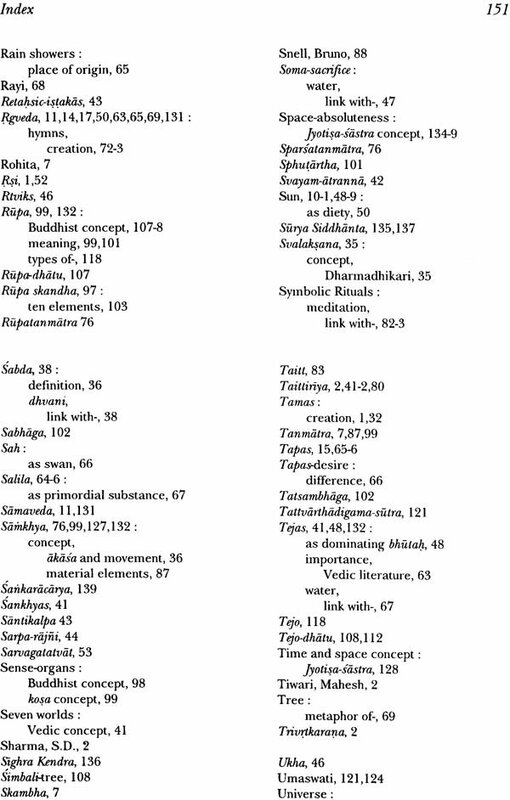 Devanathachariar in his Sanskrit paper gives the arguments of Buddhists for the non-acceptance of Akasa as a bhuta and the counter-arguments of the orthodox school. An English translation of this paper is also provided for the benefit of those who would like to read in that language. 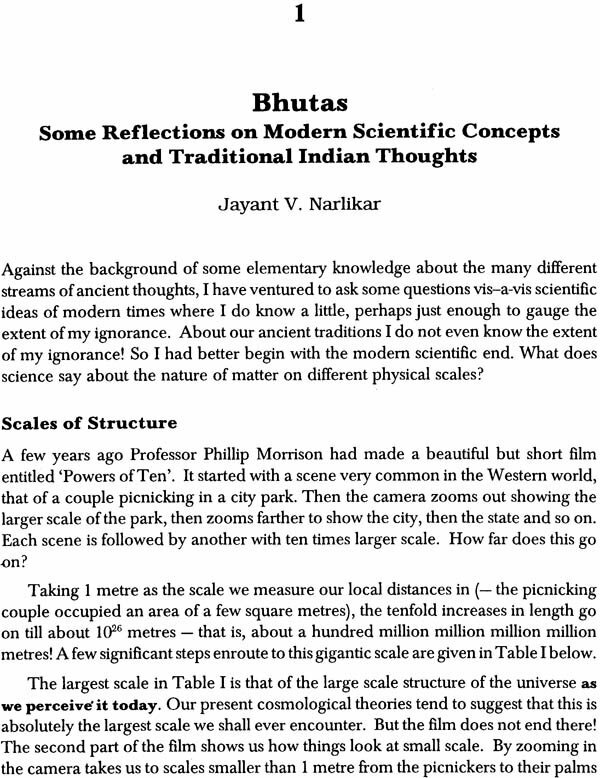 Mahesh Tiwari's paper discusses the Buddhist system which approves of only the four bhutas and how the adjective Maha was added to the name bhuta because of their vastness. He further elucidates that all these bhutas are accepted as mere appearances - they exist only in name and form. There is no creation as such in their system and what is appearing as world is a beginningless stream. He further discusses the transition of the term bhuta as dhatu. A.M. Ghatage, traces the chronological development of the word bhuta in Hindu and Greek traditions - which presupposes a living principle and not merely a dead matter. Just to avoid this double meaning, the Bhuddhist and Jains used the term dhatu in later times. The final stage of development as a psychic principle is traced by him in his paper. 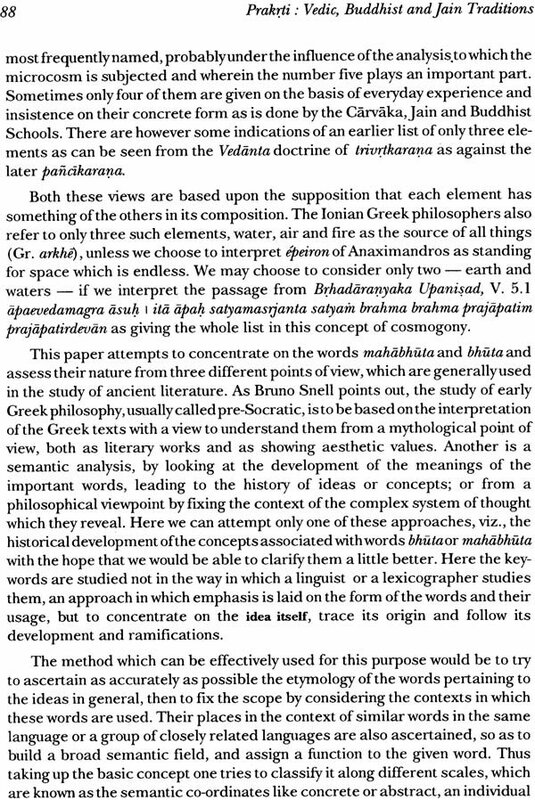 Mangala Mirasdar takes up the Jaina viewpoint of panca Astikayas and shows how .Akasa is considered not as an element but some evolute giving space to other material objects. 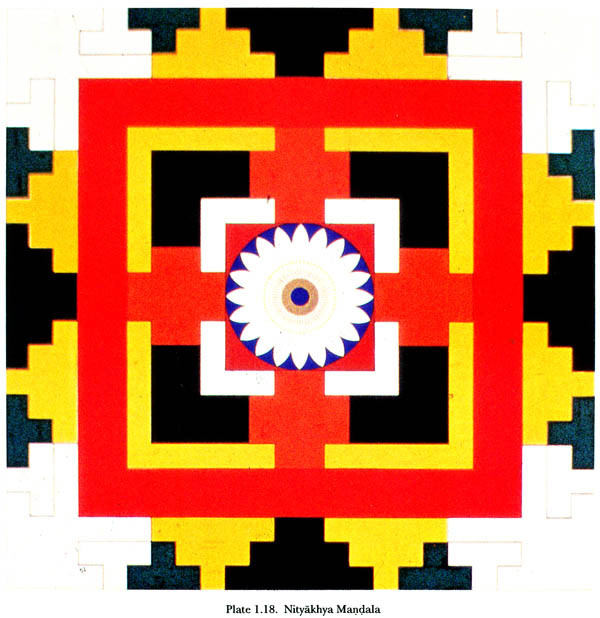 Pratibha Pingale describes the panca Skandhas as detailed in Abhidharma Kosa and other works. S. D. Sharma discusses in his paper how in Astronomy the five elements were treated - their good and evil aspects and the methods of alleviating their evil effects and increasing the good effects. From the papers that are presented here, one can see that the rudiments of later Darsanas were already there in the Nasadiya Sukta, the Ambhas Sukta etc. The findings of Vedic seers are corroborated in some respects and controverted in others, with the development of modern science. The Upanisadic Philosophies still remain the bedrock of lndian thought. Their conclusions stress that it is not the prima, manas etc., that animate the body, but a conscious principle running through the veins and arteries as the sap of a tree. This sap is universal but takes different shapes even as the bodies differ due to different wombs and seeds. Another aspect of Vedic philosophy is that the Brahman expands and contracts in cycles and in this process the invisible makes itself visible through various forms. The infinite or all-pervading principle can neither increase nor decrease. The third aspect is about the evolution of human beings. Brhadaranyaka Upanisad and other works talk of separate creations of man, animal and others in pairs of the male and female counterparts. This theory confirms that both the male and female aspects are not complete in themselves, but are complementary and supplementary to each other. The Ardhanarisvara principle or Laksmi residing on the chest of Lord Visnu are all born out of this understanding. Finally I thank Dr. Kapila Vatsyayan for asking me to edit this volume and for the confidence that she reposed in me. I also extend my gratitude to Dr. Saroja Bhate for organising the seminar on "The Concept of Bhutas: Vedic, Buddhist and Jain Traditions" held at the Department of Sanskrit and Prakrit Languages, University of Poona in March 1992. Thanks are due to Dr. Sudha Gopalakrishnan for assistance in editing. These seminars have enriched our understanding and the objective with which IGNCA started them, has been fulfilled to some extent. I hope and wish, that, readers of these Volumes will immensely benefit from these papers. I pay obeisance to the supporting energy of the Lord in the form of the earth which remains established as the prime base for sprouting the seed of the universe. Indian Art, both conceptually and in practice, is embedded in a world-view and cosmology, which is based on the fundamental elements (mahabhutani): earth, water, fire, wind and ether (space). We find a system of correspondences between macrocosm and microcosm, linking the gross and subtle levels, as is evident in the Vedic as well as Agamic traditions. This conception finds its immediate application in ritual, which can serve as a key to these relationships and to the rich symbolism implied. The correspondences between the elements, in their gross and subtle aspects, sense-perceptions, and human emotive states have been elaborated at all levels of the Indian tradition. All these conceptions and practices have influenced the Indian aesthetic theories, and have found expression in the different media of the Arts. Taking the mahabhutas as the concrete starting-point, these interrelationships can be examined in the case of each art-form. They appear at different levels: at the level of the material, at the level of the creative process and artistic articulation, at the level of communication and aesthetic receptivity. Besides the aesthetic and symbolical dimensions of the mahabhutas, their ecological importance should not be forgotten. Man formed by such a tradition lived in harmony with his surroundings and expressed a deep reverence towards the earth on which he dwells, the air he breathes, the water which purifies and gives life, the fire that transforms, and space which gives him the vastness to live. When he draws mandalas on the ground, their symbolism of colour and form gives expression to this relationship. When he pours offerings into the sacred fire, he is conscious of the power and manifold nature of the element, and so forth. The Indira Gandhi National Centre for the Arts has since its beginning been concerned with fundamental themes underlying the Indian Arts, exploring them in all possible directions and thus opening a new and deeper under- standing of the artistic traditions. After exploring the concepts of Space and Time,! another basic theme has been examined in its various dimensions in several seminars: the concept of the cosmic elements which have been classified as five in the Indian tradition. A Seminar on The Role of the Elements (mahabhutas) -in the Indian Arts and their Agamic Background has been held at IGNCA, New Delhi, from March 12-14, 1992, of which the papers are presented in this Volume. Our life depends on the cosmic elements - earth, water, fire, air and space - but we are rarely conscious of this fact, whether in our own body or in our environment. Any discussion on the elements should lead us to a greater and more immediate awareness of this dependence and to a cosmic sense of responsibility, otherwise it is a futile academic exercise. The arts, as any human activity which needs a material support, are a sublimation of the elements, "transformation of nature in art", in Coomaraswamy's formulation. Every art-form has its own immediate material, but it uses all the other elements and their transformations in one way or another. It was one of the scopes of this Seminar to explore the relationship between specific art- forms and the elements predominating in them, not only in their material aspect, but in their symbolic function and quality. Water does not only mean the physical element but the quality of fluidity and the symbol of life; fire does not only mean a burning flame, but the quality of intensity, of heat and burning, etc. The texts are full of descriptions of the qualities and symbolic value of the elements. But the elements or mahabhutas in their .gross form are part of a whole cosmology and cosmogony. Their role in cosmogony cannot be discussed here, because it would require a separate treatment. 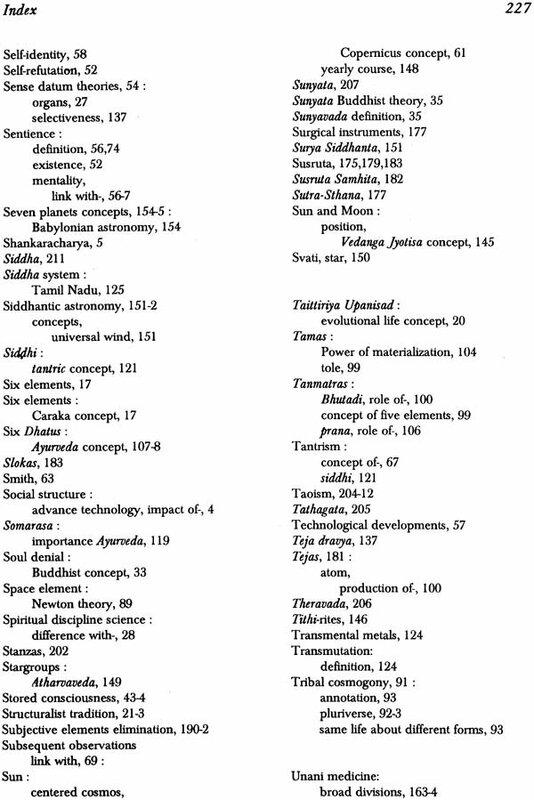 But we have to place the elements in the total scheme of cosmology which is the system of the tattvas - whether 25 as in Samkhya or 36 as in the Agamas. The system of the tattvas presents a perfect ecological balance. 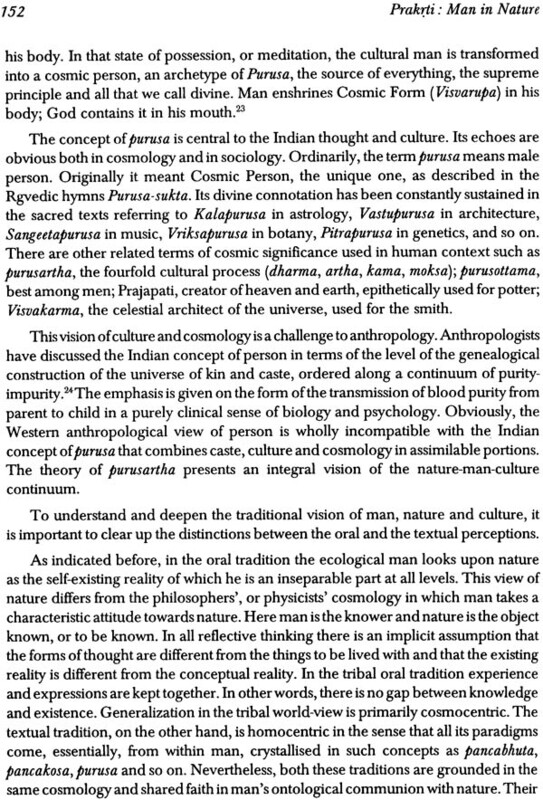 Ecology in the modern Western sense is limited to nature and remains artificially cut-off from the mental and spiritual dimensions, whereas the system of tattvas contains everything: the gross elements (bhuta) cannot be separated from the subtle (tanmatra), nor from the sense-organs (Indriya), and beyond them to the subtler mental faculties. Even the latest theories of modern physics have again discovered that the observer cannot be left out of the picture, that the observed is not just an 'object'. In the system of the tattvas the elements are the basis of the pyramid, and the ascent is from gross to subtle and beyond: sthula, suksma and para cannot be separated. Thus the theme of this Seminar on the bhutas should not be and has not been understood as a limitation, but as a starting-point. The elements are the very basis of the universe, and any sublimation has to start from them. Or, seen from the other side, there is an evolution from the supreme (para) to the subtle and from there to the gross elements. In another aspect, too, the elements are all-pervading, that is in the symbolic field. Where they are not present materially, they are present symbolically. At all the levels, even the most subtle and spiritual, we find elemental symbolism. As an example we may mention the three yogic nadis being identified with sun, moon and fire. 1. In actual practice cosmology becomes manifested in ritual, life-style, festivals and art. How are the Indian arts manifesting, expressing, integrating this cosmological scheme in their different media? How does the concept take on flesh and form and sound and movement? What are the methods of transferring this cosmology into the visual and audible form that we call art? 2. We should not adopt a complacent attitude with regard to the Indian tradition, as if everything were in harmony. We should rather seriously ask ourselves why it is that a tradition with such a wisdom in relation to nature has fallen into such neglect of nature and has allowed an ecological disaster to happen in its own environment. Can our reflections on these inter-relations between cosmology, ritual and the arts be more than a romantic looking back to a lost harmony, and can they create an awareness of the urgent need of the hour? Can the arts, and the theory or philosophy supporting them, become an instrument of integration and ecological awareness, instead of being cut off from their context and used as an isolated act of entertainment for the privileged few? It is here where the Agamas / Tantras can play a crucial role of mediation, with their integration of the senses and of matter into spirituality. Here a word of explanation on the limitation and scope of the topic of this Volume is necessary. The essays collected here are based on papers delivered at the Bhutas seminar held in Inter-University Centre for Astronomy and Astrophysics (IUCAA), Pune, from August 24 to 27, 1992. The seminar was jointly sponsored by IUCAA and Indira Gandhi National Centre for the Arts, New Delhi. The ancient wisdom contained in the Vedas, Upanisadas, other sastras and the Ayurveda discusses the concept of matter in various forms. The word bhutas used here is to be taken as symbolising these concepts. The ideas include the nature of matter on the micro-scale as well as on the large scale, the nature of living matter, the origin of life itself, holistic medicine, Yogasutras, etc. Modern science has brought in new perspectives. What is the ultimate micro- structure of matter? In the sequence of atoms-nuclei-quarks - is there an end-point? How, where and when in the universe did the various chemical elements form? Where is the frontier between physics and biology? What is the link between the 'living' and 'non-living' matter? What are the current ideas on the origin and evolution of life? How do they influence modern medical systems? To what extent is there a commonality between the ancient and the modern streams of thought? The methods of seeking answers are different, but are questions basically the same? Can a dialogue between two systems with such- manifest differences be successful? This seminar was attempting such a dialogue. It sought to bring together intellectuals (who may not otherwise participate in a joint discussion) with the hope that the cross-fertilization of ideas would be productive. (vi) Any other relevant aspect of matter not covered explicitly in (i)-(v). 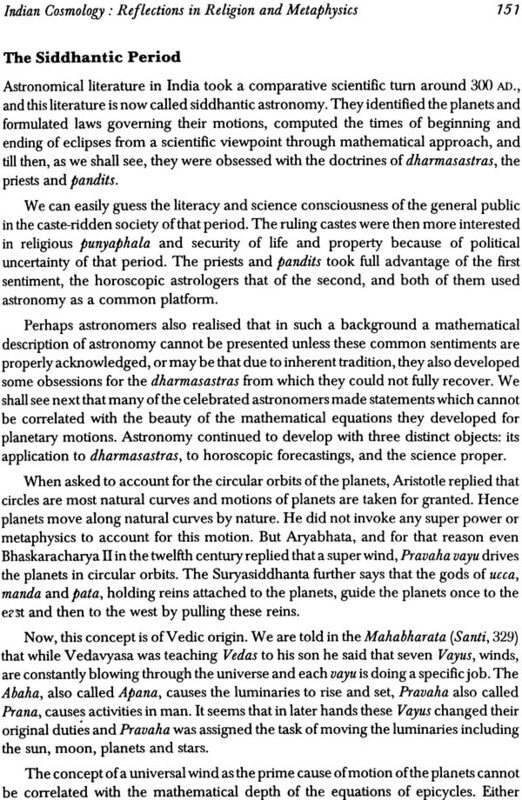 On the scientific side there was participation by physicists, biologists, astronomers, chemists, geophysicists, etc., while on the traditional side scholars from humanities, holistic medicine, ancient Indian literature, Ayurveda, etc. participated. The participants cooperated by not being very technical since the workshop was interdisciplinary in nature. They highlighted the basic concepts and march of ideas rather than specific details. The long discussion sessions were enjoyable for their liveliness and spontaneity. 1. The database of ancient manuscripts should be made as complete as possible to enable scholars to use it for research purposes. The IGNCA may help sponsor this important activity. 2. An objective assessment is needed about the state of knowledge in past in the various fields listed under the subject-matter of the seminar. 3. Each of the topics listed above deserved extensive interdisciplinary discussions in their own right. As such further seminars could be initiated by the IGNCA and other interested institutions. I am happy that the views of participants here will give the readers some glimpses of the depth and range of the subject-matter covered. I wish to thank all the contributors to this volume for their cooperation in submitting their articles promptly. Finally, I am grateful to Dr. Kapila Vatsyayan and her colleagues at the IGNCA for making it possible to hold the seminar at IUCAA. What does a fish know of water in which it swims all its life? What does a man know of nature of which he is an integral part? The ancient answer is: he knows and he knows not. Men through the ages, through popular wisdom, philosophies, religions, and sciences have tried to understand their place in nature, their linkage with the universe. The twenty papers here collected, which are based on the IGNCA seminar on 'Prakrti', held at New Delhi, on 5-12 January 1993, offer some thoughts on this profound concern. Being the fifth and the final of the series of seminars concerning the mahabhutas or the five-elements, this volume culminates in a cross-cultural and multi-disciplinary expedient thinking about 'Man in Nature'. It can be read independently of the four preceding volumes which deal with the 'Oral Tradition', the 'Vedic, Buddhist and Jain Traditions', the 'Agamic tradition and the Arts', and 'The Nature of Matter'. IGNCA's main concern in this project (see Foreword) is : (i) to explore the fundamental and universal concepts capable of rejuvenating man's perception of his primary foundation, and (ii) to create a harmonic understanding and communication through a developed multi-disciplinary vision. The sole aim in these introductory pages is to present a conceptual overview of technical matters raised at the seminar. The Views of Modern Science Modern era, from the beginning of the seventeenth century, has been dominated by a scientific-technical worldview where man is regarded as the central player. With the publication of Isaac Newton's masterpiece, Philosophiae Naturalis Principia Mathematica, in 1687, the old idea of the universe faded. The Newtonian view of matter as inert substance struck roots in Western thought and culture. Industrial Revolution was its logical and direct consequence. Experimental technological development created a new confidence in man, and Europe eventually became the light and leaven of a new world. The shadow side of this turning was the disintegration of a coherent cosmology and the danger of a catastrophe. With the new machine age the forces of nature were harnessed, the face of the Earth was drastically altered, and the 'new man' began to look at himself as the master of nature, the maker of history and the measure of all. By tragic irony science itself came to be controlled by technology. 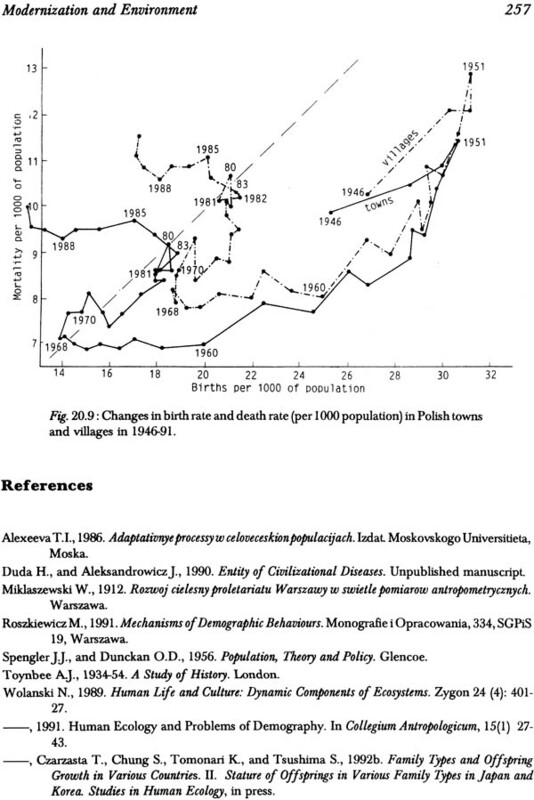 Much faster than expected, the pursuit of science and technology became the most Significant of all human affairs, effecting and affecting politics, economics, religion and social life. The machine-mindedness, accompanied by the erosion of a unified vision, resulted in complete demoralization and depersonalization. In this overthrow some men of science see the 'inadequacies of the human mind' (see Narlikar) and the mistake of materialism. 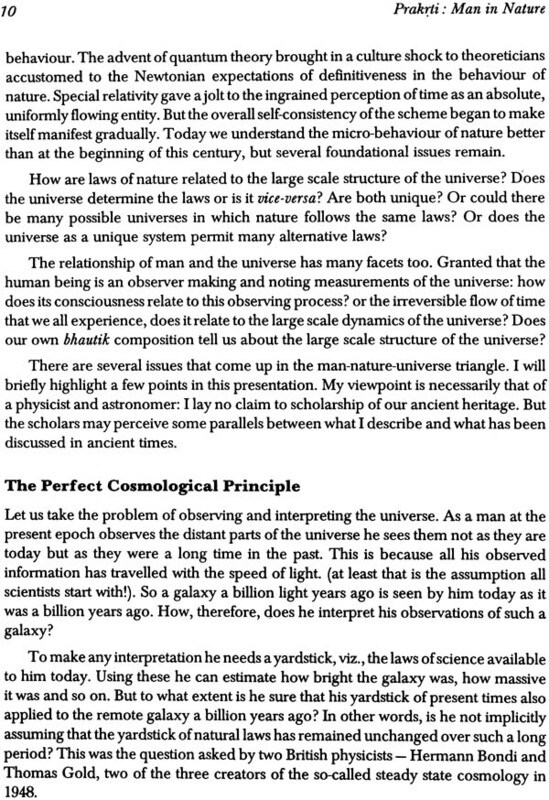 Today scientists describe man's place in the universe in terms of the perfect cosmological principle and the anthropic principle (see Narlikar, also Malik). In essence these principles present a picture of steadily expanding universe in which man the observer has attained a certain level of intelligence in the course of the evolution of life. One important contribution of the cosmological principle is that it has dethroned man from the 'centre' of the universe. According to current ideas, all galaxies in the universe have the same status and man in his galaxy is just one of them. Some scientists, such as Stephen Hawking, propose two versions of the anthropic principle, the weak and the strong. The weak anthropic principle states that it is only in certain regions of the universe that necessary condition for the development of intelligent life, a typical human, exists. According to strong anthropic principle there are other regions of the universe or universes, each with its own initial configuration and its own set of laws, where the conditions would not be right for the development of intelligent beings. 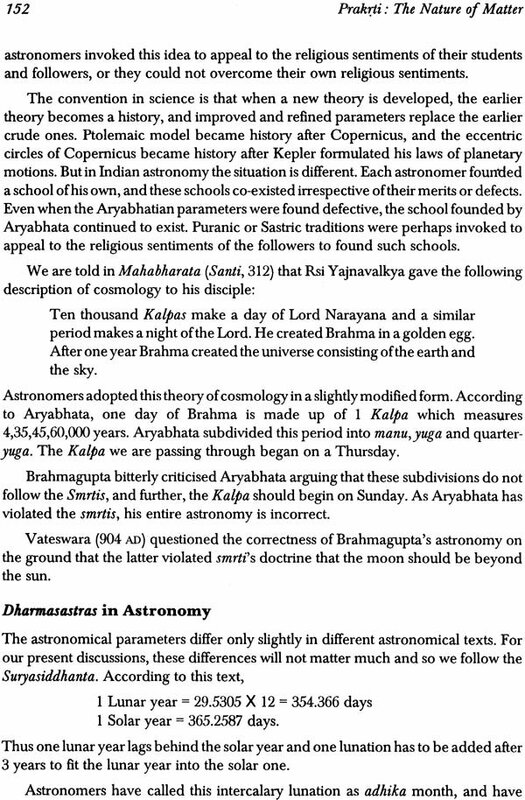 However, as Narlikar maintains with characteristic clarity, "It is not sharp enough for believers in the principle who would like to demonstrate that physical parameters are finely tuned to human existence, nor it is convincing enough to persuade sceptics who might attack its speculative nature, because we still know too little about the formation of planets, about the origin and adapatability of life, about the evolution of intelligence, and so on." The search for extraterrestrial intelligent life can advance only if there is a clarity about what exactly life is. There is no difficulty in recognizing the various forms of life on Earth. But until today the ontological difference between the living and the nonliving has remained unsettled. Since Darwin it is conjectured that origin of life on Earth was simply another step in general evolutionary sequence. Malville, with a spirited wit and sophistication, examines the origin of chemical elements which have biological Significance. Giving extraordinary importance to supernova explosions in the formation of Elements that build planets or life, he reconstructs the origin: "The iron which reddens the soil of Earth and Mars and which courses through the veins and arteries of reptiles, fish and mammals originated in an ancient supernova. Slowly but steadily most galaxies acquired the ingredients necessary for life. Our galaxy planets were formed with the stars; other planets also contain mud, fire and perhaps even alien versions of blood." 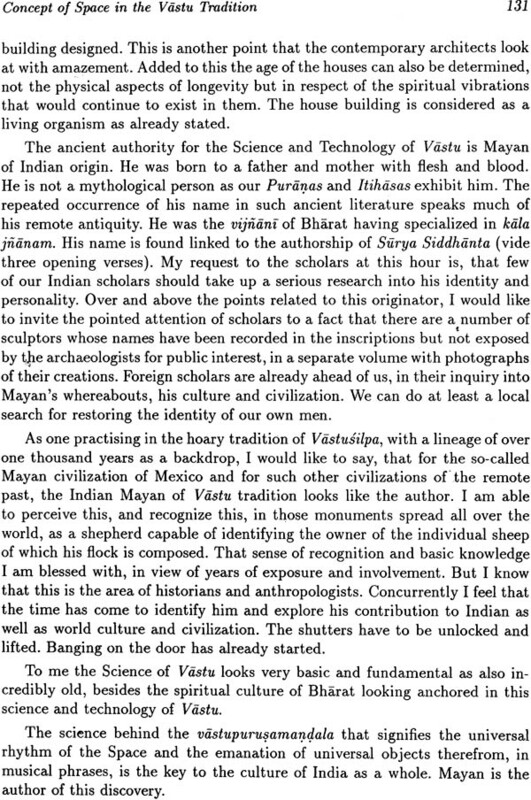 To corroborate his findings in astrophysics, Malville presents the cosmogonies of the America's intertwined blood, bones and earth which find reference throughout the ruins of Mesoamerica. The notion of Elements as building blocks of life is widely accepted in science. The transmutation of one form of Element to another is a subject which has illuminated the imagination of a large number of scholars in various fields. Ranganathan provides several examples of illustrious scientists, artists and philosophers who have contributed to the fascinating field of interaction of colour with the Elements. C. V. Raman, for instance, was able to relate the perception of colour in some areas of physics and astronomy to a holistic perception which included the application of the quantum theory of light to physiology and human consciousness in its sweep: "Raman's holistic perception of colour has an epic grandeur which is similar to Niels Bohr's holistic theory of complementarity and Roger Penrose's new theory of physics with the phenomenon of consciousness in the new areas of psychology and neurophysiology". appropriately; Malik traces the development of this holistic theory from the discipline of science, but goes beyond it to show that holistic perception is a phenomenon of universal consciousness: "The universal principle of organization immanent in all things manifests itself in a cosmic pattern, in which it is particularized in successive wholes, constituting various scales as self-enfoldment. In this way the world comes to consciousness of itself and explicitly realizes its essential nature, in its reflective awareness and interpretive conceptualization by intelligent human beings." What overtakes scientific thinking today is the problem of life. Although it seems clear that there exists other planets with chemical elements having biological Significance, the possibility of intelligent life existing elsewhere in the universe is still remote. However, the notions of 'cosmic self-organization', 'Earth as one living organism', 'universal consciousness', and 'holistic theory of complementarity' have gained considerable prominence in contemporary thought. The Vision of Ancient Sages Advances in the new physics have affirmed that on matters concerning the universe there is no fundamental difference between the experimental scientists and the mystical sages. Of the post-mechanistic paradigms, for instance, the concept of 'expanding universe' agrees with the Upanisadic notion of (expanding Brahman', and the cosmologists claim that the universe has been borrowed from the (vacuum' echoes in the philosophy of 'sunya (zero) Brahman'. 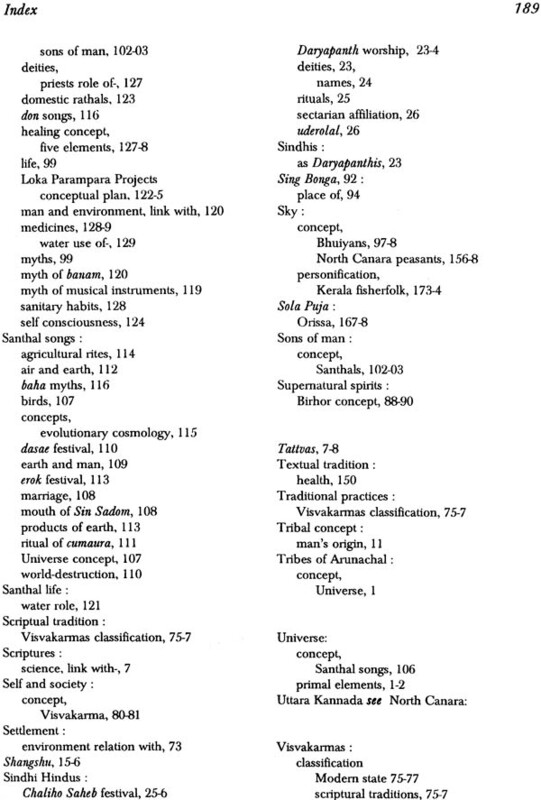 The other theories built around the scientists' conception of the world such as (liberation of matter', (cosmic strings', (galactic seeds', and the 'living universe' can be traced back to the Vedic sages. 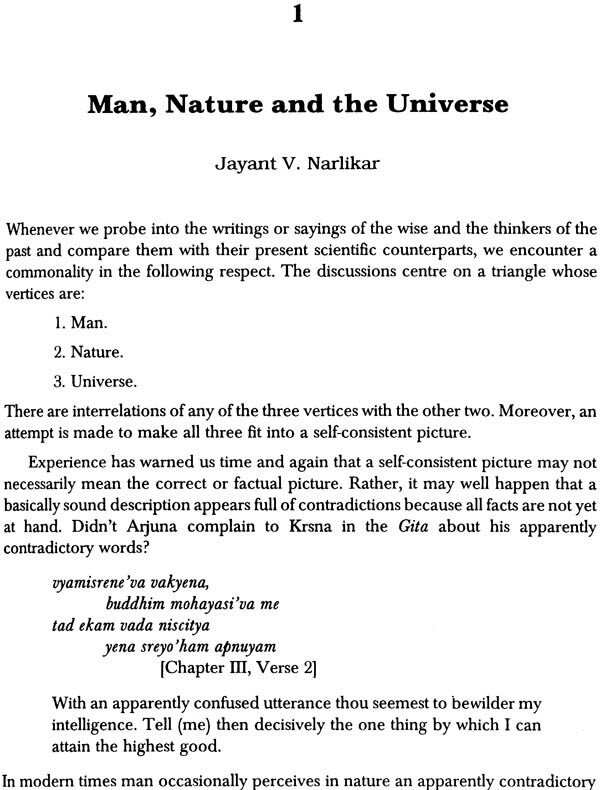 Adopting this view of the nature of scientific truth, Narlikar has pointed out that "information regarding the origin of the living systems and the universe may find echoes in ancient wisdom". Malville has produced striking evidence of how "overriding insight is the same from astrophysics and the origin myths of cosmogonies". Taking the thought a little further one may find that in explaining nature and the universe the traditional vision offers a richer and more encompassing worldview. The Sankhya and Vedanta philosphies of purusa-prakrti, for instance, provide a very clear formulation of the natural phenomena of the universe. Wood attempts to interpret nature (prakrti) and consciousness (purusa) in a new way as a philosophical division experience into objective and subjective parts: "The objective principle of nature is represented by conceptions of divine immanence in the changing manifestations of creation; and the subjective principle of consciousness is represented by conceptions of a transcendent spirit, both as a transcending God in the macrocosm of the external universe, and as an inner or spiritual essence of soul in the microcosm of individual experience" .